Macworld critiques Photoshop CS5. Let's not forget about the hand that feeds it etc..
Today, I'm going to look breifly at how I use adjustment layers. An adjustment layer applies color and tonal adjustments to your image without permanently changing pixel values. For example, rather than making a Levels or Curves adjustment directly to your image, you can create a Levels or Curves adjustment layer. The color and tone adjustments are stored in the adjustment layer and apply to all the layers below it. You can discard your changes and restore the original image at any time. As a small aside you can now access an extensive set of help files on the web directly from the help applicaiton in photoshop. The key issue here for me is the ability to make and adjustment to say colour balance density or saturation of an image and then brush through the mask to locally adjust the image to best suit my ideas and intentions in photograph. This approach offers a degree of control unheard of in the history of colour photography. Combined with a desktop inkjet printer like the Epson R2400, I now have a complete home colour darkroom. And of course, again, no pixels are destroyed in the process. Continue reading Photoshop Layers 3. Yesterday, I talked about 4 kinds of layers. The first in my list was just a Layer, an empty one. 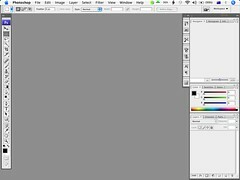 As an artist with a training in wet darkroom processes and the production of photographic prints as objects, I actually have little use for many of photoshop's features, this layer does however have a fantastic use. If I fill it with 50% grey, and change it's blending mode to soft-light, this enables me to burn & dodge an image in a NON-DESTRUCTIVE manner as I would in a wet darkroom. I've never quite understood HOW¶ this works, but it's power, simplicity elegance, and infinite un-doability makes it a must have trick in my bag of photographic darkroom tricks. Then using either a) a paintbrush and black or white at low opacities, or the burning & dodging tools again at low opacities, in photoshop you can totally re-map the tonality of your image shifting emphasis on areas in a way that painters have understood for 100's of years. The real beauty of this is if applied subtly there will be no obvious artefacts creeping into your image and even if they do, they can be wound back by using the opposite colour to change, not to mention that no pixels are edited directly in the image thereby non are destroyed and no issues such as banding creep into you prints. ¶Many of the blending modes remain a mystery to me, and as photographic tools there are only really a couple that I would use regularly, this being one of them.  All of these articles will be written from a paper output approach, as when producing screen based work I rarely make modifications to my images, due to the great unknown which is monitor calibration, and monitor colour spaces. Continue reading Photoshop Layers 2. One night a week, I privately tutor a friend in Photoshop. Typically at the end of the session, I come away with insights about the application and how people understand it. Monday night was no different, except this time I still feel invigorated enough to talk about it in the hope that it will help others to understand this cumbersome destructive & powerful tool. So I guess i've got the next few days covered in terms of blogging. A special type of layer, called a Smart Object, contains one or more layers of content. You can transform (scale, skew, or reshape) a Smart Object without directly editing image pixels. Or, you can edit the Smart Object as a separate image even after placing it in a Photoshop image. Smart Objects can also contain smart filter effects, which allow you to apply filters nondestructively to images so that you can later tweak or remove the filter effect. See Nondestructive editing. You work with layers in the Layers palette. Layer groups help you organize and manage layers. You can use groups to arrange your layers in a logical order and to reduce clutter in the Layers palette. You can nest groups within other groups. You can also use groups to apply attributes and masks to multiple layers simultaneously. Essentially there are 4 types of layers in photoshop. Each has a use that can be combined with other layers to provide a level of photo manipulation unheard of for the average person prior to Photoshop 4, Photoshop itself is over 10 years old maybe 15. Plain Layers, clear of information, waiting to be edited. Layer Mask, which is used to hide and reveal differences between 2 or more image layers, again in a non-destructive manner. Text Layer, used for, well text. Continue reading Photoshop & Layers. Well I guess for a change*, I have egg on my face, I can't find the read-me file that I could have sworn allowed you to use an older Photoshop Licence to extend the beta of the Photoshop CS3. It seems I was wrong. I cannot find the file in question and the only read-me that comes close only talks about upgrading to CS2, ah well. Looks like Photoshop might be going to take a step back in our program at PIC? There are alternatives. I've also e-mailed the support team at Photoshop to express my concerns over this issue. Part of me wants to think that they will take notice, but another is more realistic. Hi I am an educator/artist/photographer, I teach photography and photoshop, to post secondary students, over 100 students a year in fact. Photoshop has been the main photo editing tool taught in our college for many years. Needless to say I was excited to be given an opportunity to trial the beta version of CS3. However, my disappointment sank to great depths, after speaking to Technical help today and was told that older Photoshop licence numbers can NOT be used to extend the 2 day trial period of CS3. Given that I am unable to reasonably evaluate the software, I will no longer be in a position to advise as to it's suitability for my students. The outlay for my college is very high and I am not prepared to pay for a product that MAY not suit our needs. I will be advising ALL my future students to seek out and find alternatives to Photoshop, and personally will investigate options open to myself and my students for cheaper smaller and faster applications to use to edit their photographs. *For those of you who know me this is a joke. So now I ring the help line and get put through to tech help. Tech help claim that it is not possible to extend the life of the licence beta with an older license number, and could I send them the file in question where I read that this could be done. I have to find the file and send it back to them! There is apparently a legal workaround with older versions of Photoshop to extend the beta's life, I am still waiting however to hear back from Adobe for the answer. I guess it's to be expected given the Christmas period and all? ...and popular isn't always the best, I'm told that this photo-blog is popular, I can see why it's popular but that doesn't make it good work. It is all obviously processed in a post production tool like photoshop. Over processed at that! Photoshop CS 3 is now available in beta! More learning is just around the corner, so I can keep my photoshop workshops current. Edit. So I tried my CS Licence number and hey presto that doesn't work so it looks like I get a peek at it for a grand total of two days! On the Digital Photography School Blog in fact, in an article about using light to add impact to your photography. Here's a nicley distilled list of tips to help take better photos. I've just used the headings, the whole article is over on MSN. Aimed manily at people who like to wander the world at large camera in hand. Lens hoods, Use them Always! Steady your camera, if you want sharp images do everything in your power to make them so. Get outside more often, seeing what is going on around you is a good thing, learning to read light is a lifelong craft. Get outside when others don't. Capitalise on dramatic lighting situations. Keep the composition and the background simple. Hurry up and wait. "Fortune favours the prepared"
Don't get caught with your camera down. Think about different ways of framing your subject, try them out. Texture, kind of self explanatory really. Mood, use it to your advantage. Meaningful juxtaposition, even though I hate that word juxtaposition, it is so true, and in the urban environment everywhere. Padded camera bag, handy but not essential. Supplementary lenses, handy but learning to see with one lens first only improves your ability to see all the time. I offer these tips to stem the "oh I'll fix it in photoshop" attitude that is becoming more and more prevalent these days. I have had some interest in a open prac day using the labs at PIC to allow former attendees of my workshops. So now that the year is winding down I guess I better get off my backside and do something about it. Open access to a Lab of Macs with Photoshop CS on them, access to a scanner, and a printer. I then drift around the room and help people when available. 10:00am to 4:00pm, $50.00 per head, minimum of 6 attendees. Colour film processing [35mm and 120] $3 plus the Prac fee. Cash on the day. Saturday October 21 or Saturday October 28 2006. E-mail me with your interest, I am prepared to accept Flickr contacts as well in this endeavour. I will probably squeeze in one or two more workshops between now and December as well more info on my website. 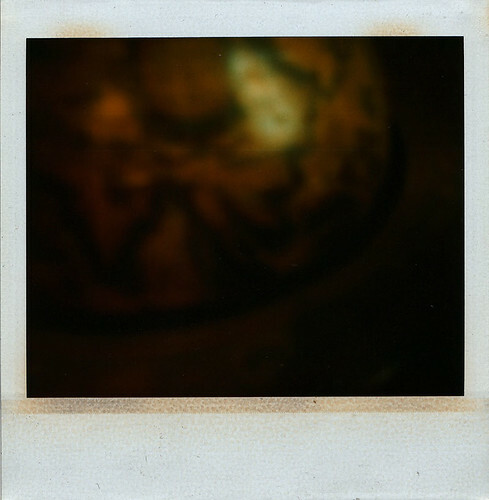 A continuing series, of glimpses of my Polaroid project as it gets uploaded. I am over halfway now in the scanning and processing, thankfully Photoshop™ has a nice set of features allowing a level of automation that alleviates the drudgery of resizing and converting file formats.